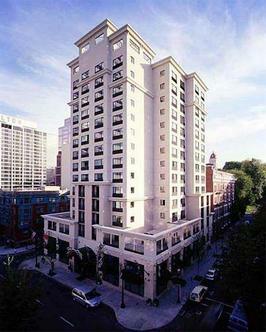 The Portland Paramount Hotel offers an excellent downtown location. Guests of this stylish hotel are just steps from shops, the Schnitzer Concert Hall, the Portland Art Museum, and any other number of great attractions. There’s even a new urban park right across the street that can be a welcoming place to relax. For trips to other parts of the city, the Portland Paramount Hotel is also close to the MAX Light Rail and the Portland Streetcars. A fantastic downtown location is just one reason to consider the Paramount when trying to find your ideal Portland accommodations. Stylish and elegant, the rooms and suites feature such delights as custom-designed bedding, windows that open, flat screen TVs, clock radios with MP3 hookups, personal refrigerators, and Gilchrist & Soames bath products. Should the budget allow, the sophisticated Skyline Suite is the most exclusive accommodation at the Paramount Portland. It offers 750 square feet of space to go with such added amenities as a glass fireplace and a jetted tub. Some of the other guest units also have jetted tubs, and there are balcony units as well. Outside of the 154 rooms and suites, guests of the Paramount Portland Hotel will find a business center, a fitness center, and an onsite restaurant that specializes in Asian cuisine. Among the hotel’s available services are concierge service, room service, laundry/dry cleaning, wake-up calls, and luggage storage. Guests can also request a safe deposit box. Valet parking and continental breakfast are available for an added fee, and should romance be the focus, there are special Paramount Portland lodging packages that can help set the mood.